Lauren Patti our new Leader Success Strategist from ioby came to visit us as we were hard to work n room 220 at PS 20 today. And she jumped right in. The cabinet area which will be part of the library looks a thousand percent better because Lauren cleaned it up! Ioby helped us fundraise for Room 220. Lauren is appropriately attired in an ioby tee shirt. Ms. Brady, our awesome teacher is wearing the PS 20 tee. DK Holland and Monica Snellings and some of our volunteer kids surround them. We have been sorting the thousands of books in Ms. Brady's class — and categorizing them. We created a very DIY labeling and shelving system for the 15 levels of reading necessary for 5th grade at PS20. 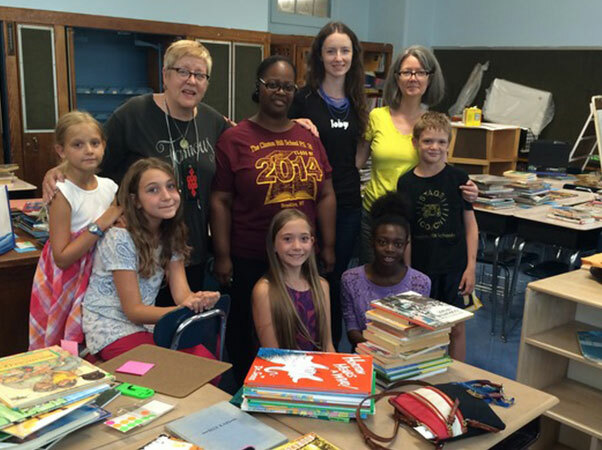 Because PS 20 has not had a budget for a librarian, teachers have their own libraries right in their individual classrooms. This is both good and bad. Good that books are so easily available to students. Bad that the books take up a huge amount of space, crowding the room and they are hard to keep orderly! We are bringing color into the classroom in a systematic way. We found a nifty crafty sticker maker and figured out how to make giant adhesive backed dots on the spot – a lot like the candy buttons that kids buy at the corner store. Ruth and Clara, both 11 and recent PS 20 graduates, have made a very effective team this week in room 220. And as Clara said, "Organization creates an effective classroom." We have to find a very special way to say thanks. They gave up the last week of summer to help transform room 220. Want more blog entries about transforming a classroom? Just search below for room 220. Note: The names in this article have been changed to protect the privacy of the students and teacher's privacy.